Perform has hired Martyn Jones, the former publishing director for Stuff and FourFourTwo, as its global brand sponsorship director as part of the company's expansion. 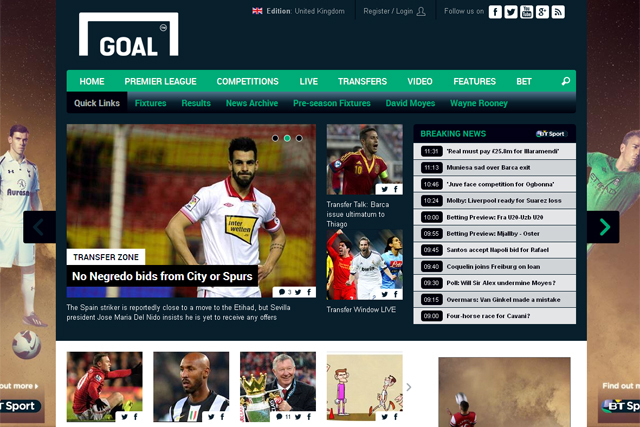 Jones will be responsible for commercialising Perform's consumer brands including the website Goal.com, which has recently undergone a redevelopment and redesign in preparation for the 2014 World Cup in Brazil. He will also be tasked with developing strategic global brand partnerships across Perform’s portfolio of direct-to-consumer products. The role has been created as part of Perfom's expansion and in particular in response to next year’s World Cup in Brazil, the increase in traffic since Goal's redesign and Perform's recent acquisition of the sports data company Opta. Jones will report to Stefano D’Anna, the managing director for worldwide sales and brand partnerships at Perform. Jones has worked for Haymarket Consumer Media for the past 17 years initially joining as a sales executive on Autocar Classified and working his way up to publishing director of gadget magazine Stuff and football mag FourFourTwo. D’Anna said: "Martyn brings a huge amount of brand, product and editorial experience working at FourFourTwo, one of the world’s largest football media brands, and clearly understands the technology sector through his work with Stuff." Jones said: "Perform have a unique global proposition that reaches more football fans than any other digital football brand. They have made great strides with the redesign and launching into new markets and across all platforms, so I’m looking forward to getting started in preparation for Brazil 2014." Haymarket Media Group also publishes MediaWeek.co.uk.